Show some creativity and class by using convenient return address labels featuring one of the most popular designs from CheckAdvantage. This is the purple version of our best-selling Simple Swoosh design. It features effortless elegance while letting you portray polished professionalism on every piece of mail you send. But the best part is how quick and easy the chore of filling out envelopes will become when you order these address labels. Forget about scribbling out your name and address every time - just stick these self-adhesive labels in place. 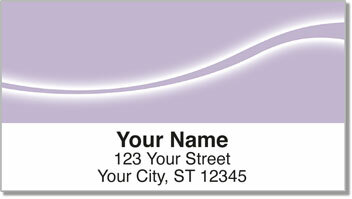 Make Purple Swoosh Address Labels yours today. They're also available in three other colors as well as matching personal checks.